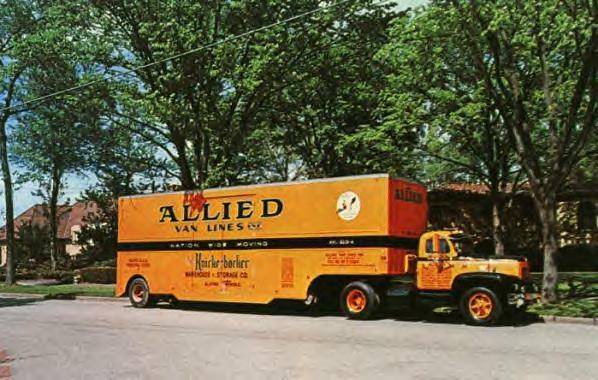 The big orange Allied Moving Van had been at our house since early morning, moving day. I don’t remember having any responsibility for preparation or packing, just as I hardly remember being consulted, barely informed that we were moving. I was playing with the neighborhood kids. Then it was time, the doors of the van were closed the four of us piled into the car, said goodbye to the neighbors and Bobbie Sargent, one in a long string of best friends, and off we went. We stayed in a motel just an hour outside of Cleveland that night and headed out the next morning for Davenport Iowa. Happily oblivious, I took my place in the back seat next to my sister, four years older. You can drive from Cleveland to Davenport in less than 8 hours today, mostly on the Interstate, but in 1954 the route was all two lane highways, going through every town, large and small. It was probably a ten or twelve-hour journey. Whether for my parents’ ease(my father drove all the time, except for his mid-day post prandial nap) or for our version of a vacation, they decided to break up the trip into two parts. You may ask, what’s half way from Cleveland to Davenport. The route goes right through Chicago and you might think that it would be a good opportunity to introduce your kids to a wonderful city. 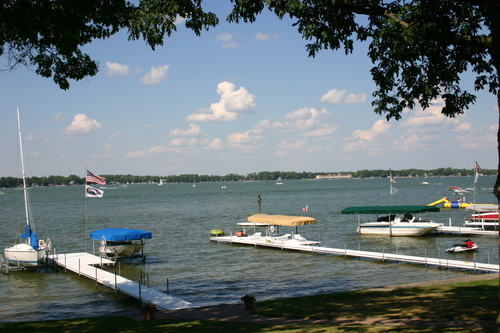 But that apparently didn’t stack up to the charm of the largest natural lake in Indiana, Lake Wawasee. 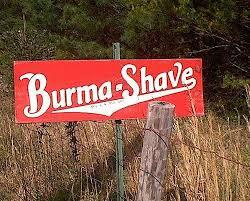 So that’s where we stopped. 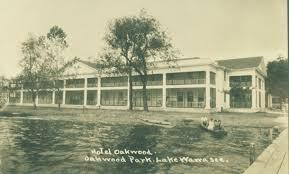 We arrived at the Hotel Oakwood, Lake Wawasee in mid-afternoon. I had been promised a boat ride on the lake, but I had begun to feel really bad, headachy with chills. 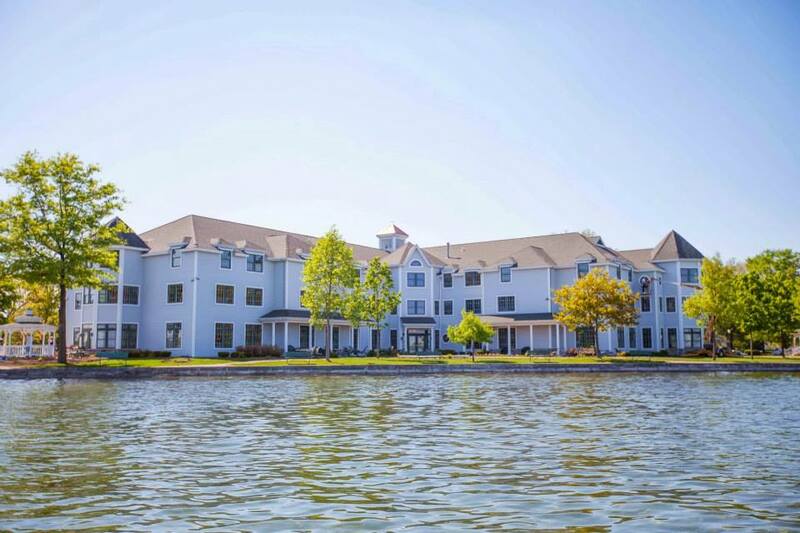 We checked into our hotel, a big building right on the lake. Our room was on the top floor under the sloping gables of the roof, overlooking the lake. I could see the dock and the promised boat ride, now dangerously slipping out of reach. I wasn’t generally a whiner but in this case I just wouldn’t accept no for an answer. Parents sometimes do the strangest things. Against all reason, they bundled me up in a blanket and off we went for that boat ride in an open 15-foot runabout with an outboard motor. In the front was a small wheel, with spokes like a ships wheel. I settled down at the helm and off we went for a tour of the lake, one happy boy. I don’t remember that anybody else got a turn. Nobody was going to pry me away from the wheel. Back at the dock, I was brought back up to our room, where I proceeded to spike a 104+ degree fever. The local doctor made a house call, or rather a hotel call, ordered some medicine and there I lay, in and out of a delirious fevered sleep all night and most of the next day. I remember very little, only that all day I counted as high as I could, all my waking hours. How high is unremembered, but certainly in the thousands. I should have carved the number in the headboard. All my life, my memory of Lake Wawasee, through that fevered haze, was of some out-of-the-way corner of the mid-west, but a friend of mine from Indiana recently told me that he had spent memorable visits every summer at rustic summer houses on the lake and Eli Lilly had his summer house there. He made particular note of having frogs legs at Frog Tavern. Oakwood Resort where we stayed 63 years ago. 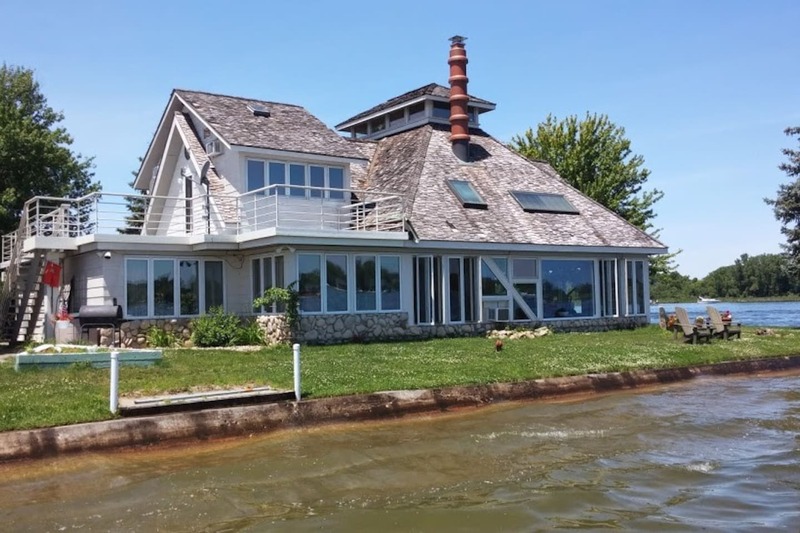 Choose from a handful of waterfront houses listed on Aribnb. This house on The Point at Johnson’s Bay seems quite idealic.